Midcoast Maine - Camden / Rockland. Mooie, het hele jaar door lakeside huis met groot dek en gas grill. Volledig ingericht. 2 slaapkamers. Slaapkamer heeft queen size bed. Volledig ingerichte keuken en alle handdoeken en beddengoed zijn aanwezig. Roeiboot beschikbaar, dobberen om te zwemmen en vissen. Locatie erg rustig op particuliere weg. Dit huis aan het meer ligt aan South Pond in Warren, Maine. South Pond is een 554 hectare grote "vijver". Camp Dobbins ligt aan de rand van het water met een prachtig uitzicht en zonsondergang! Er is een boothelling in de buurt voor degenen die hun eigen boten mee willen nemen. Je bent perfect gelegen aan de Mid Coast, op slechts 15 minuten rijden van Camden / Rockland. Oceanside stranden en activiteiten in de buurt. Seizoensgebonden activiteiten zijn onder andere jagen, vissen, schaatsen, skiën, rodelen. Skigebied in Camden. Has everything you need, owners very good, privacy good. I enjoyed my stay. Also good for family with kids in summer. We just returned home from our relaxing vacation at Camp Dobbins wonderful hosts Darryl and Vicki and awesome fireworks display put on by pond neighbors on fourth of July. Absolutely wonderful,would recommend to anybody!!! The cottage had everything that we needed. It was well stocked. We especially loved having a modern functioning clothes washer and dryer. Darryl and Vicki were helpful and available but not intrusive. The view off the deck was lovely and it was perfect for relaxing when not exploring the surrounding region. The cabin appears to be off the beaten track and it is very private but it was in easy travel distance to many points of interest. Oh, and by the way Maine is awesome... loved it. My husband and I celebrated our anniversary and babymoon here, and enjoyed the cottage tremendously. The view from the back deck just makes you want to sit back and relax. We didn't get a chance to enjoy the lake due to the fact it was a bit cold that week. But would certainly return at a different time to this wonderful cottage to do so. The owners were right next door and greeted us when we arrived and answered any questions we had. Which was a great way to start our vacation. The kitchen was awesome and used daily, we even got a chance to boil up our own lobsters for dinner and had all the kitchen equipment needed. The cottage was near some great quaint towns that we explored and got a couple day trips in to Portland and our all time favorite Bar Harbor to see the Acadia National park. Some restaurants that we enjoyed were Red Eats, Moodys Diner, Hartstone Inn (for an amazing fancy meal), and Metcalf sub shop. All were great. Anyways I could keep going on how great this cottage and little city is but I'm sure you've gotten the point. 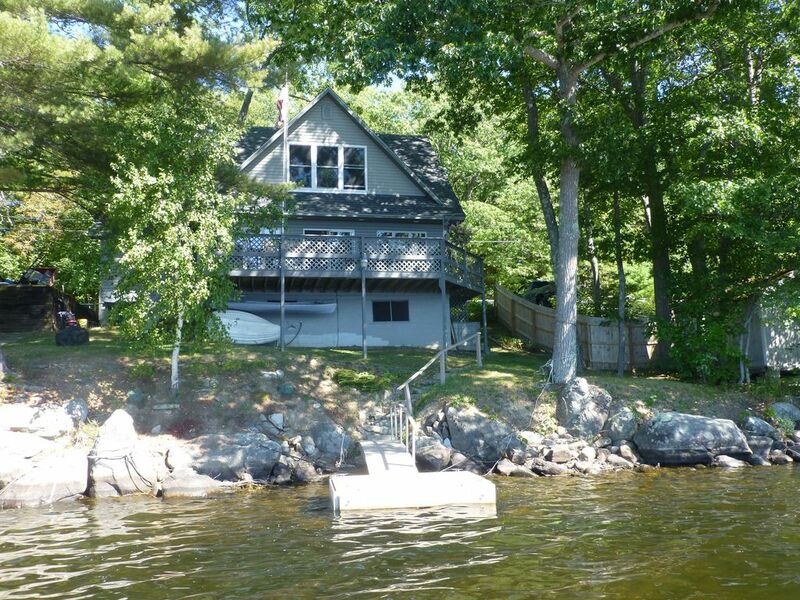 Definitely check out this cottage for the price and location. We plan to return again. Thank your Daryll and Vicki for giving us the opportunity to enjoy your lovely cottage. We had a wonderful time at this lovely cottage. The owners were fabulous to deal with and so nice. We couldn't have asked for better communication and accommodation. The cottage was clean and larger than expected. The kitchen had everything we needed. We put the TV and CD player to good use. The view from the large deck was stunning with beautiful sunsets. We swam in the lake every day--jumped right off the dock. This was the perfect location for sightseeing in Rockland, Rockport, and Camden. It was a quick drive over to the coast where we could walk around the towns before heading back for our evening swim. I would highly recommend this cottage and would certainly stay here again! Check in is 2:00 p.m. on Saturday and check out is 10:00 a.m. Saturday.